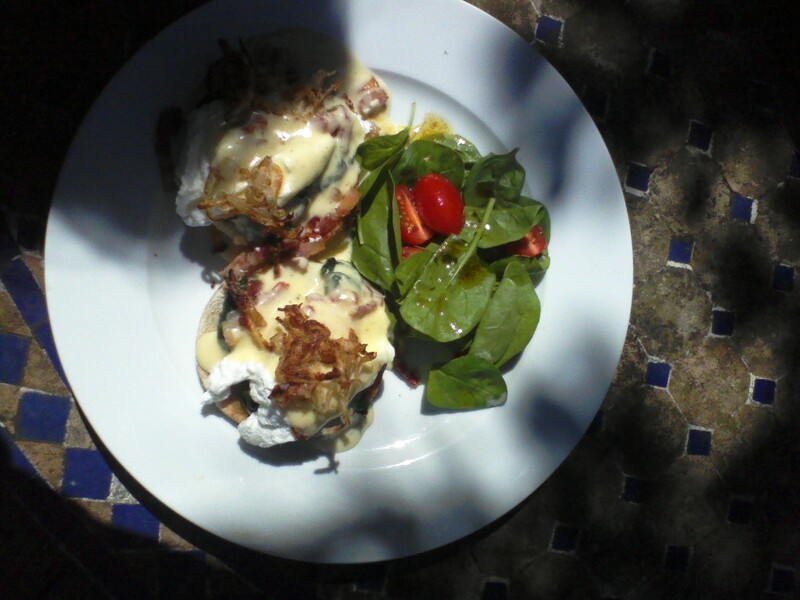 Various persons known to me have been taking an interest in my diet, thus I have pleasure in introducing you to Eggs Florentine, which is a variant on the staple New York brunch of Eggs Benedict. it’s not easy to get right, despite looking remarkably simple. Everyone has a Benedict recipe – this one is from Delia Smith, and some use Montreal bagels instead of English muffins, but getting it all together at the right time isn’t easy. Cooks reckon on a scale of 1 to 5, 5 being ‘difficult’ this dish rates between a 3 and a 4, depending on whether you cheat on the Hollandaise or not. The wilted spinach is underneath and also forms part of the salad – the little Sicilian tomatoes are cut in half and melt in the mouth. This has a slice of cooked ham underneath, the eggs must have perfectly fluffed whites and be runny in the middle – they were – and a decoration of fried and spiced onion. Perfect? Oh, yeah. Egg McMuffin it ain’t.